We are happy to introduce ourselves and present our debut album “Watercolor Dreams”. 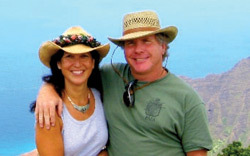 We have been writing music together as husband and wife for the past twenty years. Serendipity played its hand many times throughout our lives together, including the introduction of our most talented producer Chris Birkett by our very dear friend – the incomparable Buffy Sainte-Marie. What a wonderful opportunity to have our first CD produced by the award winning producer, Chris Birkett – whose client list includes artists like Buffy Sainte-Marie and Sinead O’Connor. A very gracious thank-you to you both for making this CD possible. These songs come from our hearts and we feel they were a gift given to us, to share with you now – they are a direct reflection of how we live in and look at the world. It is our hope that in “Watercolor Dreams”, you will find some of the same joy and magic that we had in writing and performing these songs for you. 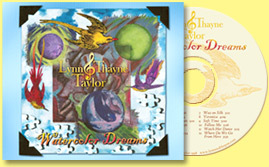 All contents copyright Lynn & Thayne Taylor, Raku Music, Kauai, Hawaii. All rights reserved.